Looking back at the most recent recession, the S&P 500 experienced three straight years of negative performance (2000- 2002) before rebounding with five consecutive years of positive results (2003-2007). While past performance offers us no guarantees for the future, historically, some of the most dramatic market gains have followed market lows or while coming out of a recession. 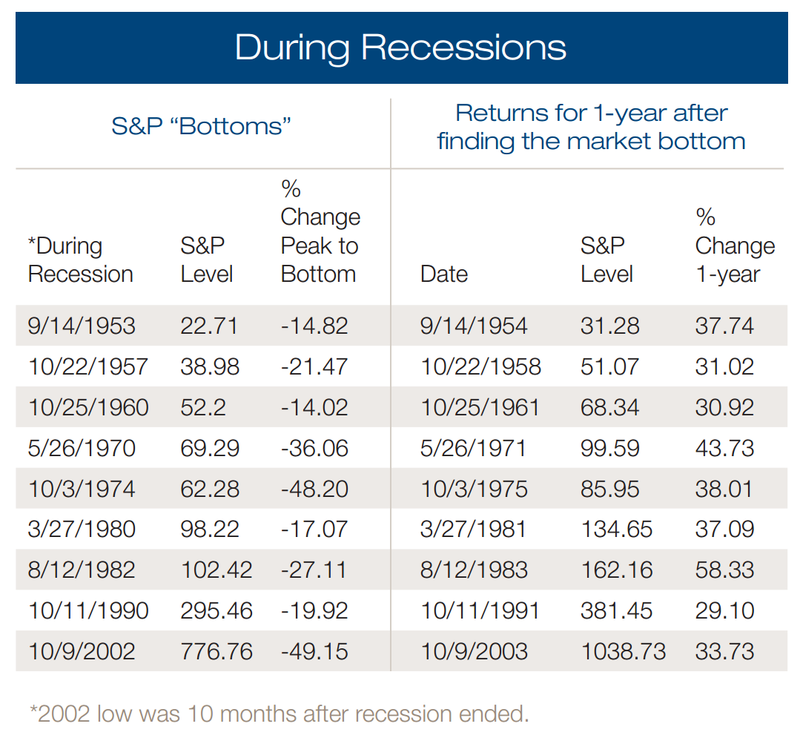 Recessions – Since 1950 they have averaged 10.3 months in duration, but the S&P 500 historically peaked 8.1 months before the average recession officially started. The market typically “predicts” a recession is coming. 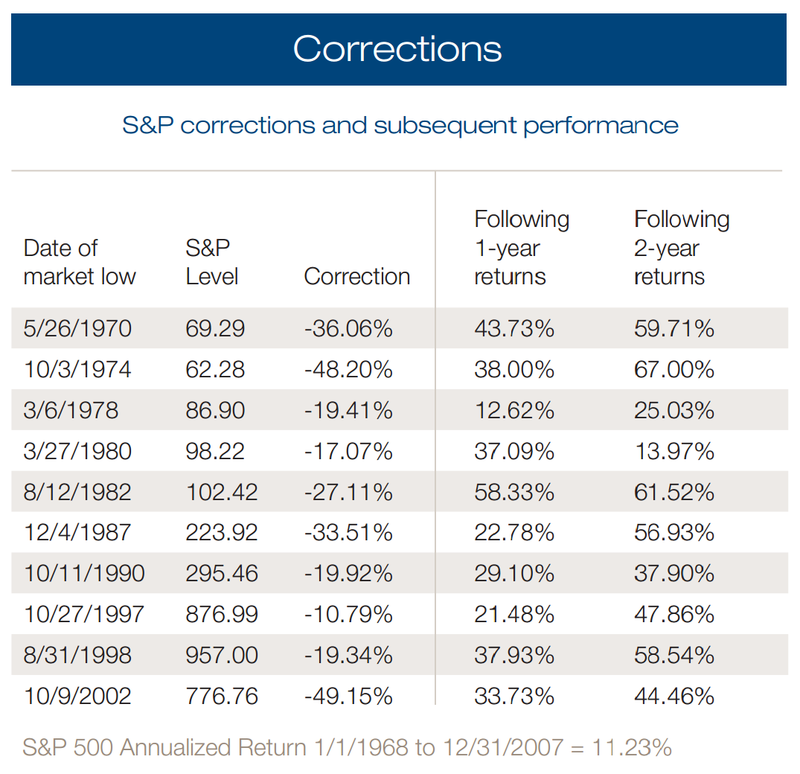 Corrections – The markets have seen 10 significant market corrections (> 10% declines) since 1970, including 4 not related to recessions. In each instance, the market has advanced at an above average rate over the year following the market bottom. The S&P 500 is based on the average performance of 500 widely held common stocks. The S&P 500 is a broad-based measurement of changes in stock market conditions. Index returns do not reflect the deduction of fees, trading costs or other expenses. The Index is referred to for informational purposes only; the composition of the S&P 500 is different from the composition of the accounts managed by the investment manager. Investors may not make direct investments into any index. Past performance may not be indicative of future results. Yet missing just a few choice days in the history of the market cycle by swaying from a disciplined investment plan can make a huge difference in the returns investors realize. The table below illustrates the dramatic loss in performance by missing some of the best days in the market. Getting out of the market is not the difficulty; it is the potential penalty for not choosing the right time to get back in. 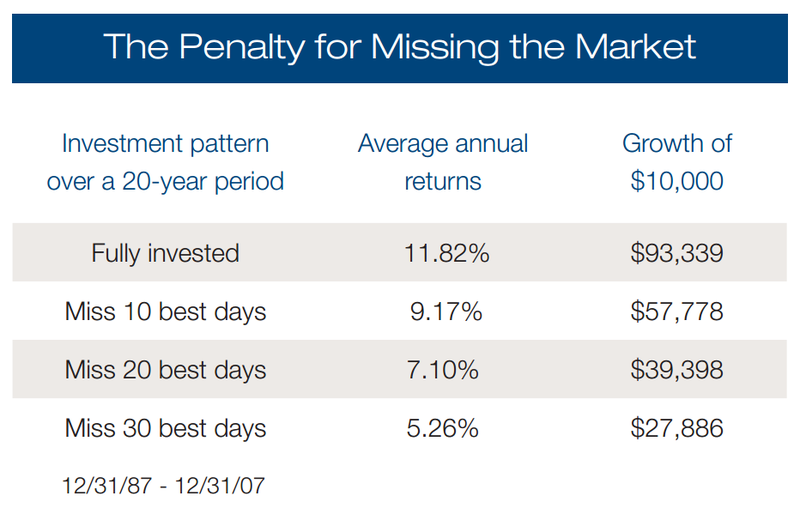 If an investor were to miss the best 10 days in the market over the last 20 years, their average annualized return drops from 11.82% to 9.17%. Missing the 30 best days during the same period drops the return to 5.26%, a potentially crippling blow to a retirement plan. This commentary reflects the thoughts and opinions of Raymond James Asset Management Services and is subject to change without notice. Presentations are for information purposes only and should not be construed as a recommendation regarding any security. Investing involves risk and you may incur a profit or a loss. Diversification does not ensure a profit or guarantee against a loss. There is no assurance that any investment strategy will be successful.